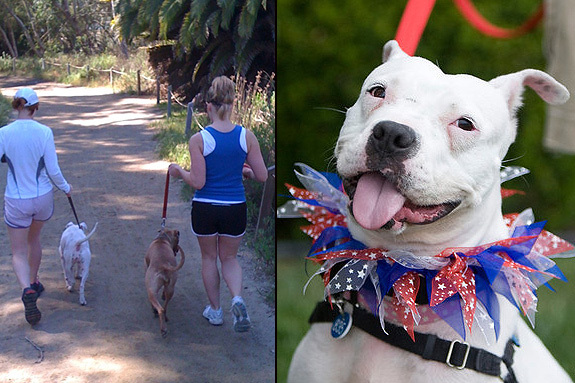 The San Diego Pit Crew is a program of the County Animal Services Shelter in Carlsbad, Calif. It is made up of dedicated volunteers, pit bull guardians, trainers, educators, rescuers and supporters of the bully breeds. With the help of Whole Dog Training, based in San Diego, we spent the last year attending dog training/obedience classes and educational seminars on pit bull type dogs to equip us with the knowledge to properly educate the public about the truths of how wonderful they truly are. The Pit Crew was a component of an original one-year pilot program called Shelter Partners for Pit Bulls, a collaboration of Best Friends Animal Society, PetSmart Charities and County of San Diego Animal Services. Although the program’s sponsorship by PetSmart Charities came to an end in December 2011, the volunteers and staff are working together to keep the Pit Crew program successfully running to allow these deserving dogs the chance to remain happy and healthy until they go to their forever homes. 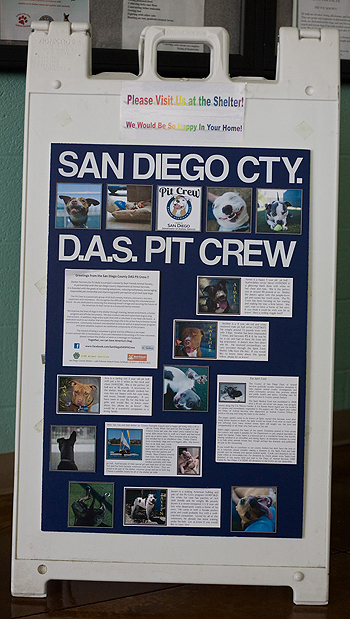 Pit Crew adoption success stories and an information board for the public, located in the lobby at the County Animal Services Shelter in Carlsbad. Picture Courtesy of Amy Mansfield Photography. Through the Pit Crew, we were able to not only enrich the dogs’ lives within the shelter walls through training and relaxation techniques in a relaxation room, but also had the chance to take some very deserving dogs on offsite visits to our homes, adoption events and to highly public areas to give them more exposure and healthy socialization. 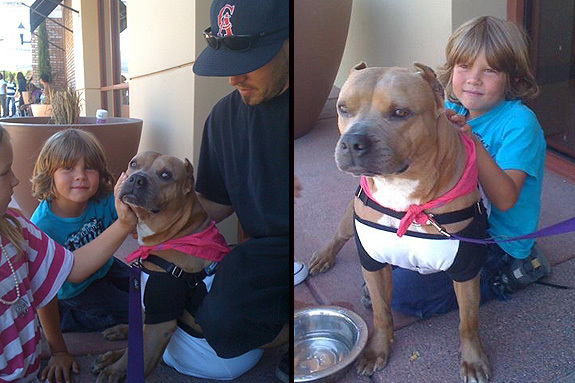 On these outings, we put “Adopt Me” vests on the dogs, giving them the attention needed to stimulate the public to ask questions about the dog and pit bull type dogs in general. This helped us spread the word about the specific dog, the Pit Crew and the benefits of adopting from the shelter. Thankfully, a well deserving boy, Brody, found his forever home on an outing in Carlsbad with a group of dedicated volunteers. Within the shelter walls, Brody was highly stressed and spent his time jumping up and down in his kennel and frantically barking. 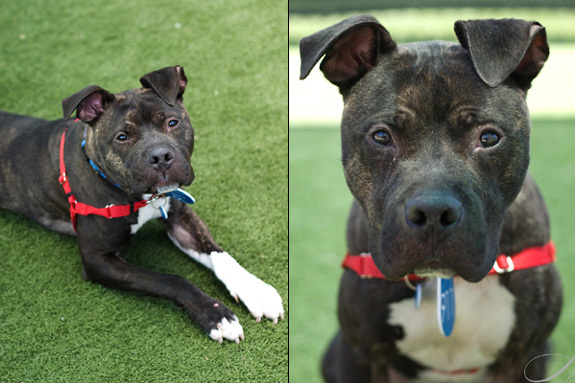 Once he was out of the shelter, Brody was the “ideal” dog, relaxed, walking well on leash, dog social and people friendly. Due to his difficult time adjusting to the shelter life however, his time was unfortunately up at the shelter, and this outing was his last chance. The volunteers met a nice family that fell in love with him! They followed the volunteers to the shelter, adopted him, and Brody went to his forever home. Brody posing for his modeling shoot with Amy Mansfield Photography, who volunteers to take all shelter dog photos. At an adoption event at Unleashed by Petco in Carlsbad, a sweet girl named Caroline met her forever family thanks to a Craigslist ad about the event. Caroline, like Brody, had a hard time in the shelter environment. Outside of the shelter, she was such a gentle, social girl with children, people and dogs. This family met her, fell in love and asked many great questions about her personality, crate training and breed characteristics. Then they went home to discuss it and make sure they were ready to commit to her and give her the life she deserved. They came back the next business day to adopt her and take her home for good. Caroline with her forever family. 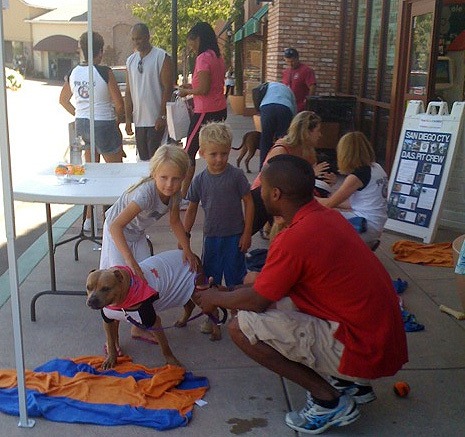 A picture from the adoption event at Unleashed by Petco in Carlsbad, where Caroline met her family. Dedicated Pit Crew members Cat Intoci, in the back, Gerry Vaught near the Pit Crew board, and Giovanni Brooks with Caroline. The majority of our outings don’t result in adoptions but, just as important as an adoption, is the impact of these outings on the dogs’ mental and emotional well-being. Another well-deserving girl, Pearl, spent 20 months of her life at the shelter. She went on countless outings and numerous adoption events but remained at the shelter. She met so many people who commented about how cute she was and what a great dog, yet she remained in the shelter without a permanent home. Thanks to her outings and the dedicated staff and volunteers, she was able to remain healthy at the shelter until Cordelia Mendoza, the local coordinator for Shelter Partners for Pit Bulls, convinced the local news station to do a story on her. She was adopted to a great home the next day! Pearl (white dog on the left) at the Batiquitos Lagoon with her buddy Chance. Pearl at 2011 Poway Patriotic Parade, courtesy of Amy Mansfield Photography. We are lucky to get to know these dogs’ personalities by taking them on hikes to the local lagoon and to the beach and to our homes. They get exercise, mental stimulation through training and proper socialization with other dogs. Not all people we meet on our outings have met a pit bull and may only know about them through negative publicity, so it’s a great experience to see the surprise and acceptance on their faces when they meet these great dogs and learn more about them and the shelter. The Pit Crew empowers the volunteers and staff the opportunity to properly educate the public while keeping the dogs comfortable and happy until they go to their forever homes. We are able to assist the staff in evaluating the dogs’ personal needs, monitor safe play groups and let them just be dogs. Our collaborative goal is to keep as many of these beautiful pit bulls successful at the shelter, making them more adoptable so that once they do go home, they stay home. 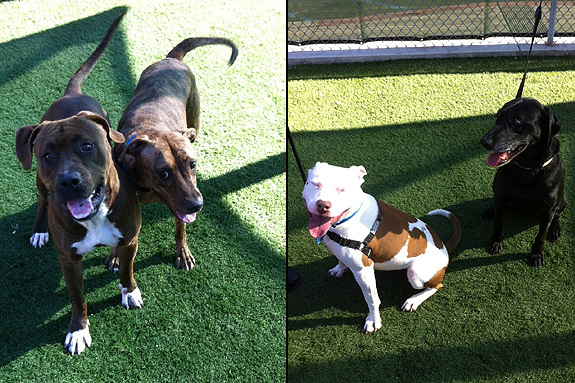 Current adoptable bully breed dogs in play groups at the County Animal Services Shelter in Carlsbad. Photo courtesy of Teri Brooks. Chantal and a volunteer’s dog, Bailey, on right. Stubbydog is full of love stories this here day!!! You guys do GREAT work there! Cordelia also rocks! Glad to see them keeping it alove although the program has officially ended. What a great thing for Pearl that Cordelia did by getting her on the news! Great job by all. So happy to see the “Pit Crew” at work. Their dedication to the dogs is inspiring. Hey! It’s Chantal’s turn to be adopted! She’s grown! Go team Pit! I have lived with pitties for the past fifteen years; all of them have come from rescues or shelters. My current baby was on “red alert”, i.e., death row, after three months at the local shelter. She was overlooked, like so many dogs, largely because of her dark, almost black, brindle coloring, according to shelter staff. She had been lucky enough to get into a foster home when we met her and fell in love. Now she is a valued family member and enjoys trips to the dog park and snuggling with us and our four kitties on the couch or on the bed. Thanks to those who open their homes to foster dogs – if Miss Agatha hadn’t been fostered, she would have been euthanized and would now be a sad statistic! Would love to feature this on our San Diego-based site. Email me for details!